Given the various shifts of 2011 in the global economy and local customer/population dynamics, senior leaders across business, government and NFP sectors all need to wrestle with re-thinking and re-enunciating the Value of their products, programs and services. 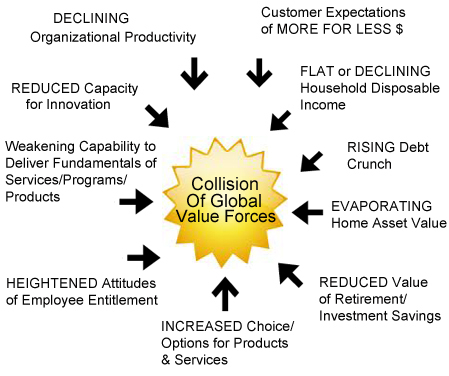 While several of the above Global Value Forces are not new, the collision of both old and new Forces in today’s environment means that it is simply “Not Business As Usual!" are not new. However, the aspects of decreased disposable income and entitlement attitudes have reached a significant level across populations. These, combined with declining asset values, rising debt levels, frustrating unemployment, and a weakening of the average employee base ability to reliably deliver on the fundamentals of service, program consistency and product integrity; many organizations are finding themselves in a tough spot. It is important to realize, that in many Indo-Asian, and some Eastern European countries these dynamics are quite different and actually opposite, thus creating a widening competitive divide. Thomas Friedman’s latest book “That Used To Be Us” shows in stark detail just how badly American organizations have deteriorated in comparison to Asia in particular. While not documented as clearly in book form, many Western European organizations are facing similar challenges. And so, it behoves all of us in senior leadership positions – Executives and Directors of Boards – to turn the tide and seriously re-think the value propositions and value strategies of our organizations before we sink further into major difficulty. When the Going Gets Tough… The Tough Re-think Value Strategy! This multi-faceted/systems-network approach to simultaneously recreating or advancing the organization on several fronts once your current value has withered is not easy. And, frankly, it inevitably generates criticism and push-back from employees, suppliers and partners who have grown ‘comfortable’ in the old ways. However, it is critical for the Board, CEO and Sr. Management to understand, explain and implement new practices - within the current business cycle. “Pulls” – A starting point in this effort to rethink Value, is to accurately identify the specific Value Forces impacting your organization and its customers, distributor channels, competitors, licensees, etc. This may require some interviews, focus groups, questionnaires and/or customer forums. Understanding these forces, we next need to understand “so what”, what do these mean to us, and to lead an exploration of what these ‘market buyers’ are likely to pull us into (with our services/products/programs), in the coming 3-5 years to help them deal with the forces affecting them. Knowledge Institutes and/or Communities of Practice. At this time, our organizations’ capacities to advance the ‘state of the art’ of our programs, services and products is critical to facilitate, foster and unleash! These are but 4 of the 8 or 9 different types of innovation that generates future value propositions. As a CEO friend of mine is apt to say, “you need to understand the basis of your Secret Sauce”. Also, we need to be honest in our appreciation of where our organization sits in the Value Continuum – Our Past Value Quotient vs. our Present Value Quotient vs. our Future Value Quotient for each major line of offerings. Be sure to consider how your value quotient is affected by evolving technology, competitor offerings, your own ingenuity, and by changing customer expectations. Value Innovation is inherently a human endeavour. As a result, we as senior leaders absolutely must address forces of Entitlement, Productivity and Curiosity/Creativity in our people. We must find ways to re-engage our employees and network of collaborators to better exchange insights, dream, connect dots, see patterns and co-create new combinations towards enhanced Value. “Leverage” – Yet another way to enhance our Value is to create a partnership or alliance with another organization so that together we can do something that neither organization on their own can do. In a leverage scenario, both or multiple parties need to contribute roughly equally to the partnership but not in the same way. Also together, you can often think in more creative ways and challenge each other’s ingenuity. Having explored the many Value Forces, kicked-up appropriate innovation formulae, truly engaged our people, and explored alliances/partnerships; now we can refine our elements of uniqueness and distinctive value positioning for the next 5 years or so. The concept of ‘Value Positioning’ has become one of the most valuable elements in developing new Vision for organizations. It can powerfully replace the old, standard SWOT approach, and meaningfully engage both Board and Senior Management in futures thinking and value-building exploraion. “Value Disciplines” and the Value ? was first enunciated in the 90’s by Treacy & Wiersema in their seminal book “The Discipline of Market Leaders”. This has become an excellent tool to engage the dialogue regarding value proposition with our clients in business, government an NFP organizations. Value disciplines help you to consider how you will position your organization in the minds of those you serve – the perception for how you create and deliver value in the marketplace. Organizations with this Value Driver are positioned in the minds of their customers/community as reliably providing products, programs and services at the lowest total cost. Elements of efficiency, mass appeal to particular features/benefits, and flawless delivery/cost slashing are the characteristics or organizations such as Wal-Mart, IKEA, many government services and others that exemplify this approach. This Value Driver is marked by an organization’s successful ability to constantly innovate and update their offerings. R&D, breakthrough strategies and/or a commitment to continuously advancing ingenuity are what these organizations are known for. Leading-edge offerings are often more expensive (they have to be in order to support innovation), however a segment of the marketplace is willing to pay a premium price for leading edge stuff! Apple, BMW and Disney are examples of organizations with this value positioning. This Value Driver is characterized by organizations that are committed to customizing their programs, products, services to the unique needs of each of their clients. Problem-solving, modularity and customer-relationship management (CRM) approaches are often the backbone of such a value positioning, and exemplified by Dell, Home Depot and some full-service travel agents. The ‘science’ behind each of these value positions have evolved significantly since Treacy and Wiersema wrote their book; however, I am amazed by how few organizations have used even the basics to help them start a strategic conversation on their Value Positioning. “Blue Ocean Strategy”, a more recent book by Kim & Mauborgne has added significant codification of approaches to advance the dialogue on Value Positioning. Tools such as their Strategy Canvass approach plus the Four Actions Framework are proving to be excellent in engaging thoughtful explorations by Boards and Sr. Management teams. This exercise challenges you to assess various elements of service/program/product that might have value to the customer. You rate your offerings with respect to High Value or Low Value against the various elements, features, characteristics. This flexible approach also allows you to add in potential new attributes you are considering and also evaluate them to identify particular areas of uniqueness and strong customer value. Reduce below industry standard-but which don’t have significant value impact. Eliminate, as the industry has taken them for granted and have little perceived value differentiation. Raise in quality, delivery or uniqueness to considerably enhance your differentiation & perception. Create new elements that are not and have never been offered in the marketplace so as to markedly separate you in the field! An organization’s ‘Brand’ becomes an extension of your core Value Positioning. A combination of enunciating and packaging their ‘promise’ to those you serve, then reliably delivering, perhaps even exceeding expectations is how you build and enhance your brand. The challenge today of course, is that market expectations are potentially shifting as you read this article. And, your Brand strength – well is it truly as strong today as it was at this time last year? Some organizations are masterful at continuously re-inventing and advancing their brand value and the value of programs, products and services; mobilizing and motivating staff to Wow their customers. Others seem significantly challenged today to get their front-line, often new-generation workers, to be motivated to care about their customers and provide reliable delivery of services/products to customer expectations. Customers just have to be able to trust that your product or service will deliver the goods! An exchange of value ($ for product) that feels more tilted towards them, than in the past. In the electronics world, this looks like faster processing, more memory, enhanced quality, sleeker more fashionable design, all for a lower or same price point. Remember all those dynamics at the top; even if we have less money to spend, we believe we are entitled to getting more for a lower price – crazy right? Reliable delivery upon expectations is absolutely crucial – and also increasingly rare. When you give to a charity or support a club or pay association dues, what are you thinking in the back of your mind? Are the services or research delivering true impact in the community? Is the overhead expense being managed efficiently so that more of my $ is going to program recipients? Will I remain in this Association another year – am I getting back a benefit worth the annual dues? Has my business or professional standing improved as a result of last year’s membership? NFP’s really have the same challenge as businesses, we just talk about it with slightly different language. However, here we also expect More for Less too! We want reliable impact & clear benefit. If we are not satisfied, the pressure on our personal funds is so huge, we WILL take our money and support elsewhere. Or maybe, we will simply give less. NFP’s can’t stand still in today’s economic conditions. Doing the ‘same’ as last year – with all the internal difficulties and efficiency challenges – is still not good enough. Donor/Supporter psychology is critical to understand and transmit to the front-lines of our NFP organizations. For civic government services – how many homeowners, with their own financial challenges, want to pay higher civic taxes? Zero! Who truly expects to pay more to heat their homes or treat their water/waste in the New Year? No one! So, why would municipalities think they can just raise taxes ahead of the base inflation rate? Provincial & Federal government departments – what citizen groups do you know that are planning to pay higher license fees, user co-payments or new charges for doing things that didn’t cost them anything last year? I can’t think of any. Indeed, our community members expect government leaders to steward their resources with ever increasing efficiency and impact – just like a business, an NFP organization, and a household. No one is immune from these Global Value Forces today. The current and growing 99% movement has almost a French Revolution ring to it! So, politicians and public servants alike must take heed. You absolutely must find ways to deliver more for less too. Governments must stop extraneous waste - $199 hammers, multi-million dollar studies/ boondoggles, or efforts to shift our attention to meaningless issues at the expense of core issues will no longer be accepted. Businesses and individuals are financially tapped out, and they are also fed-up with Fear-based campaigns. We do however; expect the fundamentals of health care, social security and education to move robustly into the current millennium, utilizing modern technology, visibly exemplifying collaboration and being user/patient/student-centered using a combination of resources rather than wasteful duplication. Senior leaders and Board/Council/Cabinet members face significant external demands in 2012 and beyond. As usual, the way of thinking that created today’s challenges, will not solve them. Do you really know what your customers expect? What do they like, what do they hate, what do they wish you would provide? Seriously, get out there and ask! Forget hiring a polling company or asking someone in marketing to do another customer survey; get out of the office and talk to real, live, customers and also people who are not your customers. 8-10 customer conversations? No, a real feel – talk to 50! Whether a senior executive or a Board member, you need first-hand context and a couple of really good questions to get the conversation going. Then, get your next layer of management out there too. And the next layer…. Perhaps you can engage some client advisory panels of the demographics you are targeting with your offerings! Facilitate exploration, feedback, problem-solving… then get to work implementing this new knowledge into next month’s delivery. Slash the cycle time for re-invention and new practice implementation, fanatically eliminate red-tape and bureaucratic fog. Develop a culture that understands, there is no time to lose! Today’s economic and individual environment and Global Value Forces, challenge us to figure out, create and deliver new Value components within the current business cycle and revamp our Value Quotient within the fiscal year. If you don’t act fast and generate a sense of urgency, you may not get the chance to do so in the following business cycle! The need for senior leaders to re-think themselves and facilitate a larger scale Re-thinking of Value across the organization has never been more compelling. This month, the connections below take you to sites with more perspectives on Rethinking your Value Proposition. HBR Blog on Value Proposition. Darwin and The Demon – Innovating Within Established Corporations – Geoffrey A Moore HBR Summary.